I have never liked contravision as all to often it just gets in the way and is not a see through as they like to think it is. Having a great big banner right across the front window like this is just asking for trouble. It might be low enough for most adults to look over the top of it, but I know that my young son will have this right in front of him which I just know he will hate. For him this will be a game changer and we will have to catch First next time we go to Tavistock as he has to have the front seat, which is no good if he cant see out! LEON DANIELS Year of the Bus underway Year of the Bus is celebrating the hard work of London’s bus staff, our heritage, the technology and of course how the bus services are the life blood of our city getting over 6m people a day to work, to school, to shopping and everywhere else! Cheshire East Council Each Sunday, we rate a local council's provision of public transport information. This week, it's the turn of Cheshire East Council. Council check: the scores so far Here's a summary of how well the councils we have surveyed so far have scored in their provision of information on bus services in their area. All marks are out of 15. York Traffic Transport Boss Dave Merrett Removed A York councillor at the centre of a controversial traffic scheme has been removed from his post as head of transport. Last August, Labour's Dave Merrett introduced a ban on traffic using the city's Lendal Bridge Catch the Bus Week The campaign’s key aim is to get people who don’t normally take the bus to make the switch during the week. In addition to encouraging modal shift, the campaign also aims to increase awareness of the benefits of bus travel in the UK in the process. Improve the Service : Make it More Complex  So, as with the Stagecoach route 700 blogs last week, there are winners and losers in these enhanced services. Three rousing cheers for First in their attempts to do some positive things, but a word or two of caution. Will customers be lost (for ever?) as a result of the disadvantages? Dolgellau Dilemma Does Gwynedd council want to encourage bus use? Or is the "cunning plan" to make travelling by bus so obfuscated that no-one travels any more? It looks dreadful. Someone needs to admit their mistake and replace it with something less intrusive. I agree, it really does look very tacky and dare I say it unprofessional. I can assume this is a result of improvements First are making so they need something extra to promote their services? Its certainly not what you'd expect on a premium brand vehicle. A re think is necessary I say. Aside from the advert emblazoned all over the front window on the upper deck of the bus, I hope the wi-fi actually works because at Go North East (Plymouth Citybus sister company) the on-board wi-fi almost never works, and on the rare occasions it does, it is excruciatingly slow! A re think is definitely needed. I was going to use Blue Flash when I go to Tavistock in the summer, but after using First E400s on Rail Replacements and seeing how nice they are, I think I will use them instead! If the banner were to be located at the top of the windscreen --- everyone could see out! A much better place would be at the top of the windscreen, instead of obscuring the view for top deck customers.... I wonder if that was the intended place? That is appalling and needs removing. Worse even than First who like putting stickers on windows. I have a meeting with Richard stevens tomorrow over a different matter. I will bring up this issue and see wot his view is. watch this space! I agree - it's ridiculous and likely to drive passengers who have a choice to the competition. Does the person who approved this ever travel upstairs on buses? 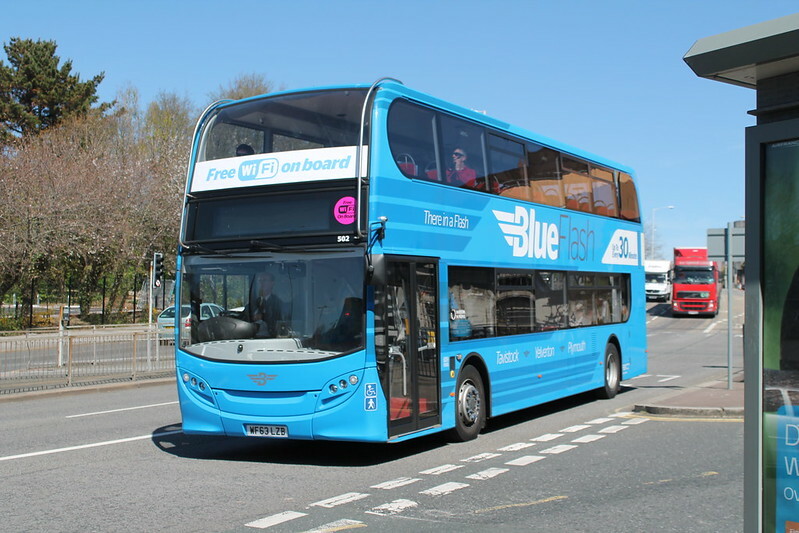 Saw a blue flash parked at mile house today with 48 wembury on the front! Have Citybus won the tender for that too? The 48 and 54 stay on the blinds in case they ever win those tenders again. I spoke with the md Richard stevens today, and brought up about the wifi sticker. it is being removed due to numerous complaints. will be put on edge of dest glass instead. That is great news. It just goes to show that if concerns like this are taken up with an operator and there are a sufficient number of complaints, they will take action. So many thanks to md Richard Stevens and all those involved in relocating the wifi sticker banner, it is very much appreciated.